Dental implants present a smile that looks and feels like natural teeth. They are surgically placed below the gums and integrate into the jawbone. This process is done over a series of appointments. 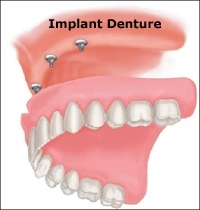 Candidates for implants require healthy gum and bone to support them. Evaluations by the general dentist and specialist will determine whether you are a good candidate for dental implants. 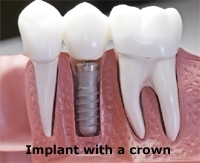 A specialist will place the implant and our doctor with restore the implant with either individual crowns, bridges, or overdentures.